You have heard that necessity is the “mother of invention”. It’s especially true for Dave Szymanski, the inventor of Chain-Serts. When he was a young boy cutting firewood several miles into the woods with his father, he broke the only file to sharpen the saw chain. This ended the day of cutting with a sore bum for David. 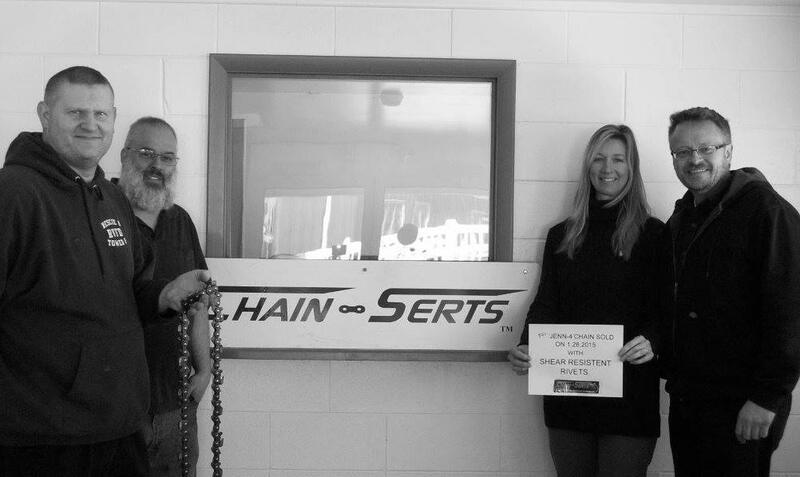 He decided then that there had to be a better way: a way that wouldn’t require sending the saw chain to be sharpened or relying on your skill and file sharpener….out of this, he designed Chain-Serts™ Since that time, Dave started his own machine shop and has been in business over 26 years. Why are the chains labeled ‘Jenn-1, Jenn-5, etc.? After each significant improvement, Dave decided to name the chains after Jennifer, his wife, who has stubbornly kept the project going. What’s the “Chain Gang” we refer to on occasion? It’s the hard-core group of four who toughed out the many years of problem-solving to make Chain-Serts a reality and continue to develop ways to cut down-time and increase profits. Chain-Serts is manufactured and assembled in the U.S.A.
Our main production facility is located 1356 N. Main St., Punxsutawney, Pennsylvania.